You can add multiple tags to each Classic Load Balancer. Tag keys must be unique for each load balancer. 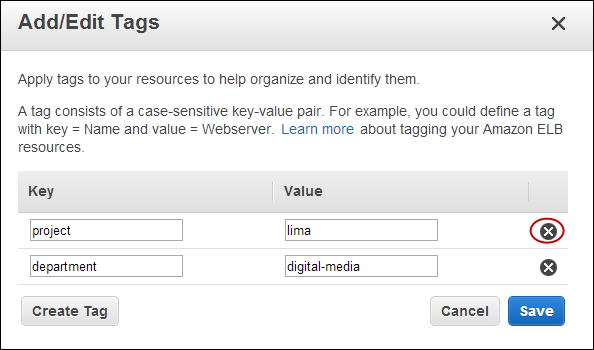 If you add a tag with a key that is already associated with the load balancer, it updates the value of that tag. You can add tags to your load balancer at any time. On the Add/Edit Tags page, for each tag, choose Create Tag and then specify a key and a value. After you have finished adding tags, choose Save. 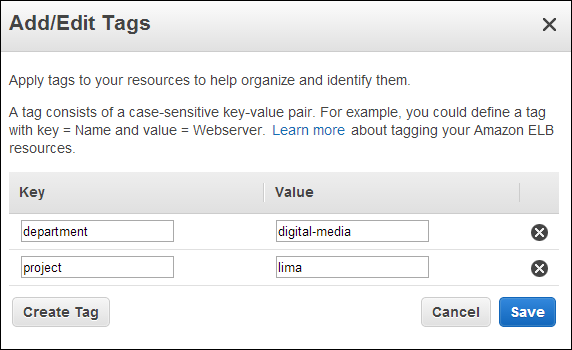 aws elb add-tags --load-balancer-name my-loadbalancer --tag "Key=project,Value=lima"
You can remove tags from your load balancer whenever you are finished with them. On the Add/Edit Tags page, choose the remove icon of the tag. After you are have finished removing tags, choose Save.